Riding your mountain bike for seven days in a row over British Columbia’s most scenic and challenging terrain takes some training and at Stages, we know training! Training with power is the best and most efficient ways to get stronger on your bike. So, seeing that you’re signed up for the BC Bike Race, we want to help you to have the best experience possible by making sure you’re fit for it. We’re making an exclusive offer to BC Bike Race competitors of 20% off up to two Stages Cycling products. 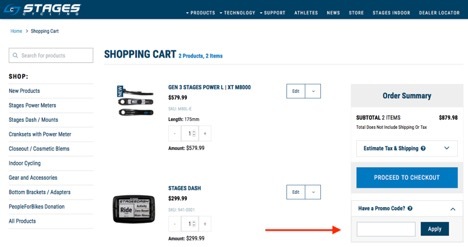 With this offer, you can purchase a power meter or a power meter and a Stages Dash Cycling computer to use as you train for this year’s event. Along with this, we’re offering free access to Stages Link (our automated online coaching and analysis site) all BC Bike Race competitors through the event. This way, you’ll have access to the tools and an easy way to use them in order to ensure you have the most fun and achieve your personal best at this year’s BC Bike Race.